Dr John Macquarrie (1919-2007) was a Scottish theologian and philosopher. He was ordained to the Presbyterian ministry, and became an Anglican in 1962. He is best known as a key existential theologian. Among his many works are Principles of Christian Theology (1966), Jesus Christ in Modern Thought (1991) and Mary for All Christians (1991) Macquarrie was Lady Margaret Professor of Divinity in the University of Oxford, and a Canon of Christ Church, Oxford. Benediction is a beautiful word. It means a blessing, a greeting, and expression of kindness and love. Benedict- ion is also a beautiful service of the Church. It is a service that makes real to us in an impressive way the fact that God is always reaching out to us, to bless, to strengthen, to assure us of his loving kindness toward us. The greatest blessing that God could ever bestow upon mankind was the sending of his Son. That was like the beginning of a new day for the human race, like a new sunrise bringing light and hope. And it is a day that will never end, a sun that will never set, for the Eternal Son has promised to be with us until the end of the world. He is no longer with us in the physical body that was his in Palestine many centuries ago, but we believe that he is really present among us in the Sacrament which he appointed. 'This is my Body', he said over the bread at the Last Supper with his disciples. The same words are said over the bread at every Eucharist, that it may be to us the Body of the Lord, so that he may come again among us today as he came at his first appearing in Palestine. And just as that first appearing was like the rising of the the sun over a darkened world, so today when the Host is lifted up either in the Mass itself or in Benediction, it is like the rising of the sun upon us and we receive the radiance and warmth of God's blessing through him whom he has sent. Many people have the idea that Benediction has become out of date in the course of the liturgical renewal of the past few years. 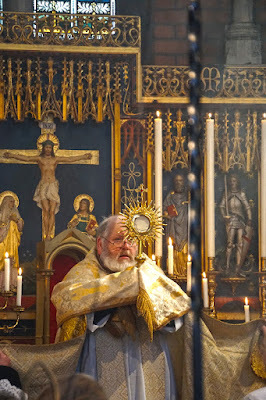 It is true that Benediction has now less prominence than it once had in Catholic worship, but it would be sad indeed if this service were to be undervalued for it is a very helpful item in our spiritual heritage and it has special contributions to make toward building up the life of prayer and devotion in these busy noisy times in which we live. Let me now say something about the meaning of Benediction. 1 shall do this by developing more fully the thought that the blessing conveyed to us in this service today is simply the vivid renewal of that great blessing of God in the sending of Jesus Christ. Just as men in ancient times were waiting for the Lord, eager for a glimmer of light through the gloom, so those who come to Benediction come with waiting, expectant hearts. Benediction is a popular service, that is to say, a people's service. The clever and sophisticated do not come much to Benediction, but the simple, the poor, those who acknowledge an emptiness in their lives that only God can fill. Even those who might not come to Holy Communion will sometimes come to Benediction where God reaches out to them though they think they are only on the fringes. I think of some of those with whom I have knelt at Benediction: harassed city-dwellers in New York, working- class people from the back streets of Dublin, soldiers serving in the deserts of North Africa, Indian Christians living as a tiny minority in a great Hindu city . . . They have all had the grace of humility - a quality which, alas, is not greatly encouraged in our new liturgies. But those who seek a blessing come with empty hands. 'How blessed are those who know their need of God' ' (Matthew 5:3 NEB). God cannot give a blessing to the proud, the self- sufficient, the superior, those who secretly despise the simple devotion of their brethren. So we can only come to Benediction waiting and expectant. As we sing the hymns and look upon the Host, we open our hearts to God, knowing that he who sent the blessing of his Son to lighten the darkness of the world still sends through the same Son his blessing to us. We do not wait on God in vain. 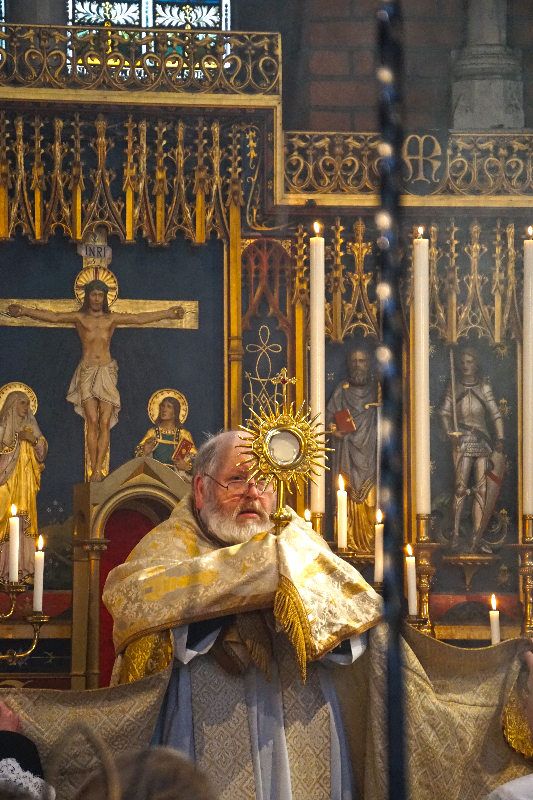 Lifting up the Host in a monstrance (sometimes in a ciborium) the Those quiet opening moments of Benediction are very precious indeed. We take time to compose ourselves, to put ourselves together, as it were. These may be only a few minutes, but they have something of the quality of eternity. We put aside our own busy plans, policies, activities, and remain passive before God so that his voice may be heard and his grace received. This brief time of quiet alone is of inestimable value in that crazy hurried world in which we all have to live nowdays. officiating priest makes the sign of the cross in blessing over the worshippers. 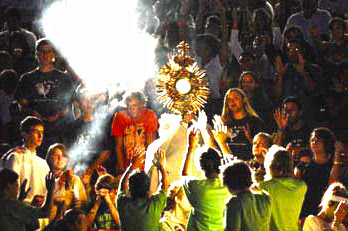 Christ, the Light of the world, shines upon us, and my comparison with the rising sun was appropriate because the monstrance is usually fashioned to resemble the sun's disc, with rays streaming out in all directions. Through Christ, God bestows his blessing upon us and all who are willing to receive it, just as the sun shines on all, bringing light and health. The seekers, the pilgrims, the weary are assured of the blessing of God in Christ, and every time Christ comes to men and women it is with the promise of a new life of hope and freedom. 'The people who walked in darkness have seen a great light; those who dwelt in a land of deep darkness, on them has light shined' (Isaiah 9:2). Then a very remarkable thing happens. For we find ourselves saying the words of the Divine Praises: 'Blessed be God' Blessed be his holy Name' We came seeking God's blessing, and now we find that we are blessing God! This belongs so naturally to what might be called the spiritual logic of Benediction. A benediction is not something that we can selfishly keep for ourselves. It makes us too want to give a benediction. 'We love, because he first loved us' (1 John 4:19). We begin by coming in our need to God, seeking his blessing. He gives us that blessing, and our response is to bless and adore him. This is indeed the goal of all our worshipping - that we may come to love God better. And we cannot love God without loving our neighbours who are God's children, so that in seeking God's blessing, we are praying that in blessing us he will make us a blessing to others. This is how it has been since the very beginning of the people of God, when the Lord said to Abraham, 'I will bless you, so that you will be a blessing . . .' (Genesis 12:3). These, then, are some of the meanings contained in the service of Benediction and some of the reasons for prizing it. Let us not miss this time of precious quiet while we wait upon God in humility. Let us not miss the blessing he bestows through the Christ who conies into our midst. For in such acts of devotion we learn to love him better, and he can make us a benediction to all whom we meet.